A few months ago while cleaning out my makeup storage I noticed a little red lip gloss that was part of a set and since I never wear red decided to give it a try and I was pleasantly surprised! A good tip I always go by is if you want to try a new colour, like a plum or a red, a totally different shade that you wouldn't normally wear then buy a shade you like the look of from a budget/drugstore brand so you can see if you suit it. Nothing worse than spending lots of money on something that doesn't suit you. So after trying this red gloss and liking it I decided to purchase a red and while browsing around the Rimmel stand I liked the look of the Kate Moss range. This is a lighter shade of red, not to overpowering for my pale skin tone I often see red shades and they are to dark and deep for my complexion but I feel this is perfect. As this is from the lasting finish range, its nice and smooth and has great staying power. 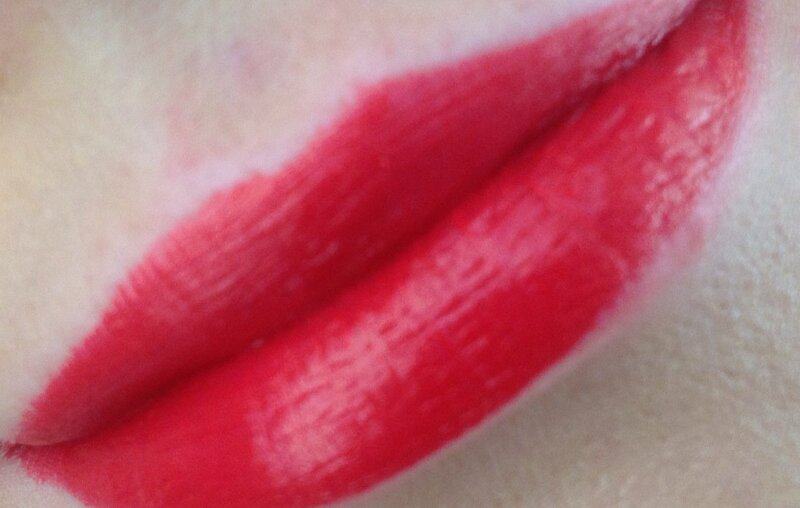 It applies nice to the lips leaving a slight glossy finish and is not drying. Since wearing this I am now loving the red shades and hope to pick up more in the near future! For £5.49 this is another great lip product from Rimmel. Team this with a basic eye with black liner and you have got a classic look ready to go! You can purchase from Boots here. I love the Rimmel lip products, this looks like another one to add to the must buy list!